Like always this time too Richa Chadda's outfit was one of the biggest blunders of the evening. Filmfare is the only time in the whole year when these B-Town ladies dig out some best of the best outfits for them to show-off on the red carpet. But sometimes the best becomes the worst and they put their name in the blunders list. Let's start with Sonam Kapoor who always has been the style icon. But this time Sonam disappointed all her fans with her extra dramatic gown. Sonam wore an Elie Saab white gown, and while the color was good the pattern was very common and the over dramatic petals in her sleeves made the dress even worse. On the positive side, Sonam won the Best Actress award for Neerja. Winning the best actress award for Neerja, was a truly special moment.. but it was made more special because @aanandlrai gave it to me.. love you sir. Thank you @Filmfare I'll forever cherish this moment. This Bollywood newcomer went with her high-slit black Shehla Khan outfit. While the pattern was not so well the Dilwale girl was making it even worse with her maroon nail color and the long earrings. While everyone was expecting Kriti in a pretty outfit, like she always donnes, experimenting with the outfit seems to have failed for Kriti this time. Well not everything was wrong her high bun with a tiara around was working as a savior for her. Kalki continued the trend of the blunders when she wore the shiny bronze lame, deep back neck gown by Nikhil Thampi. This deep plunged neck-lined dress made a special place in our worst dress list with the over shining golden high-slit. Like always this time too Richa Chadda's outfit was one of the biggest blunders of the evening. She wore skin-hugging grey gown designed by Shubhika. Her hair and make-up helped cement her place in the list as the gaudy make-up and flat one side hairs were just a disaster. 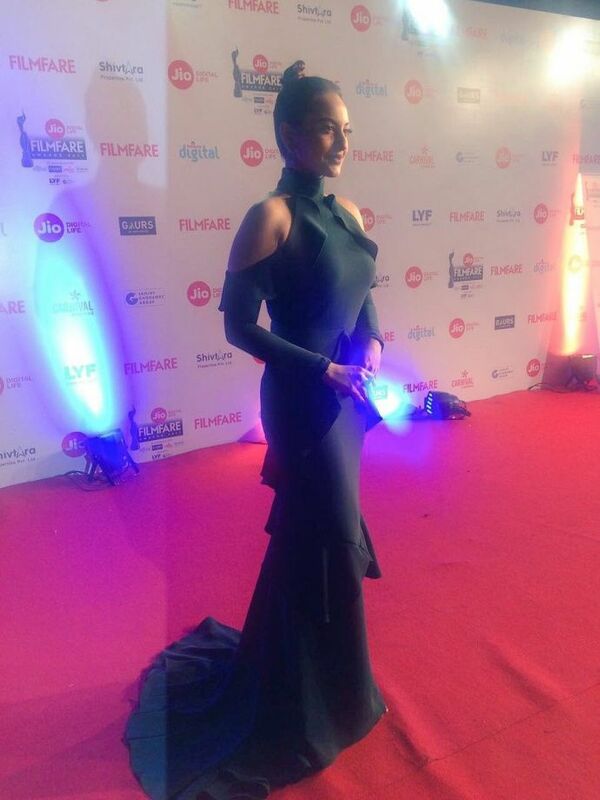 It seems after losing weight Sonakshi is in love with black. Sonakshi is getting mix reactions for her outfit but we could just say that it was an average one. The Dabangg girl walked the red carpet with her cold-shoulder Gauri & Nainika designed gown. Although Sonakshi saved herself from the blunder with her tied-up in a sleek bun and quite good makeup, she was still just average! 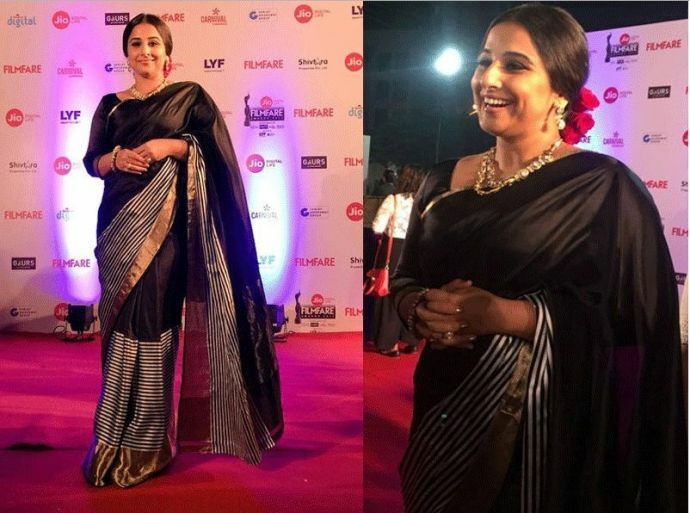 Vidya wore her regular saree again at the red carpet of Film fare. She disappointed the fans with her not so good choice. Gaudy saree with the over loud accessories and the bun with red roses were just too pathetic. She should be told that she is walking on a Filmfare red carpet not a wedding! And the blunder of the year goes to Bhumi Pendekar! This was by far the worst outfit of her for the Filmfare award. We know after losing weight this Dam Laga Ke Haisha star wants to show off her body but we think she should have tried something else.